Editor’s note: This post was originally published on March 26, 2014. We’re running it today to once again share these important podcast interview best practices with you. Here’s the simple six-step preparation process I follow to conduct podcast interviews that work. Know this: your interview will fail if you do not display curiosity about who you are interviewing and what he or she might say. What do you do if you’re not genuinely curious about the person you’re interviewing? 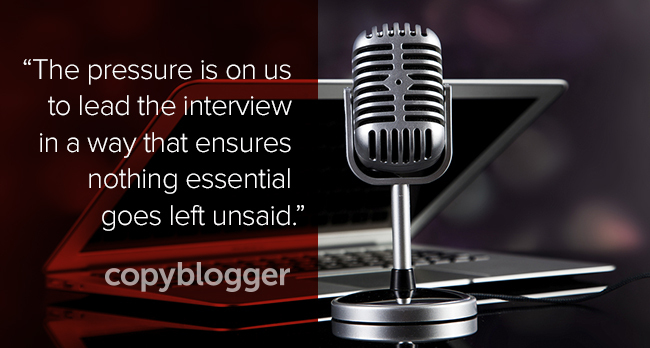 You act as if … or don’t bother doing the interview. That means doing your research to know who your interviewee is, what he knows or does better than anyone, and what atmosphere you need to create to make him comfortable. This is especially true if you don’t know the person. Think of it this way: an interview is not so much a chance for you to get to know your subject better (though you will) … an interview is your chance to be the conduit that allows your audience to get to know your subject better. You are leading your audience on a journey into the mind of the person you’re interviewing. Don’t let it be the blind leading the blind. This is why doing your research is so important. What knowledge or experience does the person you’re interviewing have that will most benefit your audience? If you are not asking this question to yourself before every interview, then your interviews are failing. Because they aren’t delivering the value to your audience that they could be. *Note that I am taking for granted that you know your audience … which should be a prerequisite before you are ever allowed to conduct an interview on their behalf. Just know that if you don’t know your audience, doing so becomes the new Step 1 above. I once put together a podcast honoring a graduating senior from my alma mater’s basketball team. The podcast includes interviews with people who all have a unique, first-hand perspective on the player that normal fans (like myself) don’t have. That was the intersection between interview subject and audience. What good it would have done the audience to have these folks discuss the player’s achievements on the court? It may have been mildly interesting, but it would have been redundant and wouldn’t have been the most value these interview subjects could provide. For these interviews to succeed, I had to extract that unique knowledge and perspective to share it with the audience. That’s what I did, and based on the response the episode got … I succeeded. It was not by accident. The interviews worked because I followed this deliberate thought process I’m outlining for you with this post. Once you know the intersection of your interview subject’s knowledge and your audience’s curiosity, you have to craft questions that will draw this out. I like to get away from the computer after I’ve done my research — maybe go for a walk or get a workout in — and let my subconscious go to work. I find that great question ideas start coming to me when I don’t try to force them. When they come, I make mental notes or type them into Evernote. Then I get back to my computer, brainstorm some more, and see what I’ve got. Typically I find the question ideas can be grouped into topic areas. I then organize the topic areas from most important to least important … because I’ll be damned if I’m going to bury the lede! Finally, it’s time to trim the fat and make sure every essential topic is covered without repeating myself. Yep, now you trim the fat some more. Remember this when you are conducting an interview: your interview subject’s words are by far the most important part of the interview — not yours. If and when you ever get interviewed, then your words can be the showcase. Typically, your audience is tuning in to hear what your subject has to to say, not you … so shut the bleep up and let them talk. One important way to maximize the time your interviewee has the floor is to reduce blabber and bloat from your questions. Personally, this is an area where I need to make gigantic improvements, because I am prone to thinking a paragraph of context is needed to preface every question. Usually it’s not. It’s important to trust your audience to know and understand the context when they reasonably should be expected to. When they shouldn’t, then you can fill in the gaps. This is why knowing your audience and subject are so important. There is no rule for when to provide context, when not to, and how much. You just have to know. You’re the interviewer. It’s your job. One way I’ve tried to do this is to write out my questions, edit them ruthlessly, and then practice reading them beforehand. This way I can read them during the interview, if necessary, and sound natural doing so. Caveat: this is a crutch that is not ideal, and it only really works for audio-only interviews. But for now it is helping me conduct better interviews. As I get better and gain experience, I know I’ll get more natural at asking questions. And by “better” I don’t mean that I’ll prepare any less diligently. I’ll still prepare questions word-for-word. I’ll just get better at “sticking to the script,” so to speak, even without having to read it, thus avoiding all the filler that delays me getting to the point of my question. A great interview often goes in unexpected directions. I’ll get to that in a second. But for the most part, if you’ve prepared well, then your interview is going to be predictable. You can probably guess how your subject is going to answer most of your questions — if not the specifics, at least the general tone and ideas. So think about what answers you are likely to get and then consider what follow-up questions you might ask. You may even want to write these contingency questions down. You will also want to play out the interview in your head from your audience’s perspective. What questions are they expecting to be answered in the interview? A good interview will deliver the unique perspective and experience of the interview subject to the audience in clear, easily digestible conversation. A great interview will give the audience insight they never expected and will even entertain them thanks to a strong rapport between interviewer and interviewee. The more relaxed an interview subject feels, the more likely he or she is to open up and be candid. And candor makes an interview kinetic. Sometimes this happens by happy accident. But don’t leave it to chance. Anticipate that if your subject says something she hasn’t said in an interview before (you oughta know), you’ll go down that road. Know that if your subject ends up seeming especially engaged about a particular topic, and there is meat on the bone, you should ask a follow-up question so he can take another bite. Prepare yourself mentally to make it less an interview and more a conversation. This isn’t always easy. It isn’t always possible. But try to take advantage of those wonderful little opportunities during the interview when they present themselves. Your interview subject and your audience will appreciate it. Comfort level is so important. Your comfort level as an interviewer, and the comfort level of your interviewee. The audience can tell, and a comfortable tone makes the content of an interview easier to digest. You develop this comfort level by setting a relaxed tone for the interview and being flexible throughout, as I just discussed. Preparation and experience should help with both. Preparing for interviews as described in this post has helped me because I don’t fear getting lost in the moment. I know I won’t end up stammering or uncertain for even a second about where the interview should go next. Experience helps because the only way to get comfortable doing something is just to do it. So if you want to improve your podcast interviews … well, go schedule some podcast interviews. Prepare for them, conduct them, and learn from them. Stay humble, and you’ll get better with every one. Do you have any podcast interview tips to share? Have you listened to the shows on Rainmaker.FM, our new digital marketing podcast network? Previous article: Is Authority Earned or Bestowed?